This is a lovely story that was sent to us by a reader. It is a pity that the powers that be could not find it in their hearts to give him the mention he deserves, so we will. Our first holiday abroad had to be somewhere special, I am fanatical over archaeology and history, and so it was that my wife Vanessa decided it had to be Cyprus, she had studied the brochures and chose Pafos as the base for our holiday. It was May the 15th 1996 that our flight touched down at Pafos airport and our most memorable holiday was to begin. I had been suffering from the pressures of self-employment and this holiday was to bring me back to my old self, Our children David (10) and Rachael (14) were as excited as my wife, but I had a frown on my face as we travelled on the air conditioned coach, the houses appeared half finished with reinforcing rods jutting up from the flat roofs, the scenery did not match my expectations, Vanessa looked at me and could read my mind! We stayed in a villa attached to Pafos Gardens Hotel, I was shocked at how spacious it was, we had our own patio with an orange tree complete with oranges !! although we had no air conditioning the cool flooring and plenty of windows kept the gentle Cypriot breeze wafting through our rooms. It took a couple of days for us to find our feet, I remember walking down the main street and a shop assistant telling me that David my son must wear a hat, I thought he was just trying to sell me one, but quickly I began to realise this was not the case, the friendliness of the cypriot people is one of the attractions of the Island ! Car hire is everywere, Its a pleasure bartering for the right price, and once I had realised that the sound of a car horn meant 'I am a taxi' I decided it was time to hire a vehicle. We hired a jeep, it was our third day, and the holiday was about to become our most memorable ever! we quickly learned to forget the maps, when we left the main road it was a case of follow those tracks, a compass and a full tank was far more important!!! we went on our own safari, knowing that the locals would wellcome us wherever we went, The Troodos mountains are beautiful, as we climbed the steep roads we were treated to panaramic scenery our only regret was not taking warm clothing with us as the jeep climbed higher. 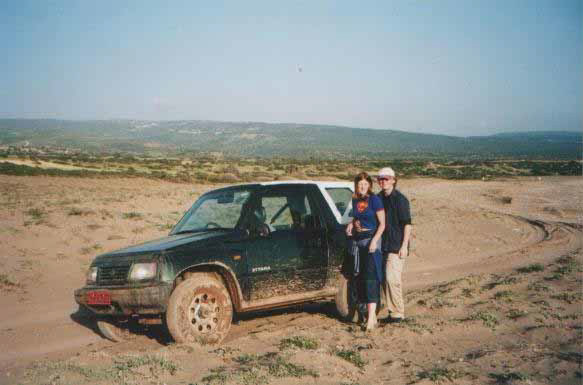 Our trips took in as many archaeological sites as we could possibly get to, there are so many, even getting there was fun! This museum is a vast floor pan of mosaics left by the Romans, it is near Pafos Harbour and is a must for any tourist. It was Monday, our holiday was getting near its end and we had decided to try places more local to make the holiday last that bit longer. 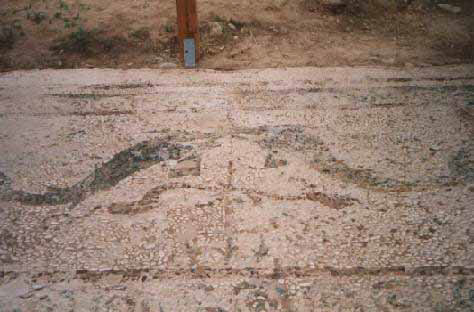 As we marveled at the many different designs our attention was drawn to a small mosaic that had been discovered under the Roman ones, It was a Hellenistic mosaic, the information board told us that at the time it was discovered this was one of only two examples ever been found in Cyprus. It was different as it was created using small pebbles, these were chosen for their size and colour and laid on edge to create a design, The one we were looking at had a mythological tormented creature. My son paid particular attention to the information board that referred to how these mosaics were made. We left the museum and drove our jeep a short way along Leophorus Apostolus Pavlou, we stopped by a large cave that cuts into a rocky plateau, It had been utilised for ancient burials. Next to this is an underground chapel Ayia Solomoni, we walked to the top of the plateau to admire the panoramic view that it gave of Pafos, we kept to the well used track that so many vehicles had made. As we strolled along the top of this plateau I was amazed at the amount of ancient pottery just lying on the ground, Vanessa and our daughter Rachael, where admiring the small but beautiful wild plants that sprang up everywhere while our son David wandered a little further up the dirt track. Suddenly he bobbed down and began brushing the dust away with his hands, he shouted back that he had found a Hellenistic mosaic! Of course we did not believe him, we assumed it was his imagination, as we continued to do our own thing, David continued to brush the dust to one side! upon reaching him I was stunned! there in front of us was our son, he was kneeling down cleaning the dust away from all these pebbles, they had been laid out in a pattern that resembled the waves of the sea, he had uncovered part of a foot, and said he thought it was Neptune! we were all speechless, we just stood and gazed at what he was unearthing! I realised the importance of this and told him to cover it back up! As the museums had now closed we had to wait until Tuesday to report it! We hardly slept that night it was so exciting. The next day we went to the Pafos District Archaeological Museum and reported David's discovery, needless to say they did not believe us, however after some convincing the officer of antiquities requested we show him, we traveled to the spot in his enormous 4x4 vehicle, when we got there David uncovered the part he had found. The officer just gazed in disbelief, he told us to get back into his vehicle and we sped off at a frightening pace stopping at St Paul's Pillar to collect two field archaeologists, from there we proceeded to a large building site, were an expert on mosaics was stationed. Although we could not understand their language the word Hellenistic kept reoccurring. David received a very warm handshake from them all. Sadly it was now Wednesday the day we had to return to England. We packed our luggage and returned the jeep, then we made our way to the mosaic for one more look, when we got there the archaeologists had already uncovered a large part of it, they had been clearing the site from 6.00am. One of them told our son that they had examined the area in 1972 with no result, and that the mosaic would soon have been destroyed by vehicles if he had not discovered it. 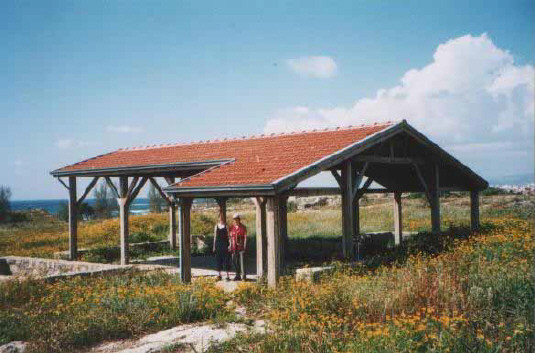 The mosaic is now on public display, a roof has been put over it, a purpose laid graveled track leads towards it and view points have been placed nearby, making the whole site a tourist area. We are very proud of what they have done and will never forget what was the experience of a lifetime, our only regret is that no mention is given that our son at the age of ten was the finder of such an important discovery! Copyright 2000 Armata on behalf of Tony the owner. We are expecting a follow up, as David and family are having a holiday in Paphos on 5th April 2002. I cannot believe I wrote to you saying I would give you an update on my son David's Hellenistic mosaic, and then forgot!!! It was not until we decided to book our next holiday on you beautiful island, that I remembered. Well here it is, hope you approve. 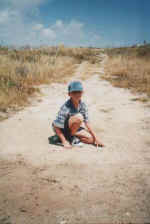 It was 1996 when David made his discovery of a lifetime, he was a child of ten at the time, but he knew it was important, he knew it was special, I remember like it was yesterday, looking down at him moving the sand and dust away from all those pebbles. Those small chosen for their size and colour pebbles, that had been carefully positioned over 2000 years ago. They had made part of a beautiful floor for some ancient magnificent building that is now long, long, gone. The time had come for us to revisit our island of dreams. It had been six years since our last visit and was well overdue. Rachael our daughter had decided to stay at home, but David was more than pleased to join us, especially as his girlfriend lyndsey was also being invited! We stayed at the Basilica Gardens, Pathos, it was nice, but we where in an apartment block, rather than a seperate villa style apartment, that had been our home six years earlier. The latter was at the Pathos Gardens Hotel, and was simply lovely.
' welcome back, where is your daughter? ' yes they really do still remember! On the way back to our apartment we stopped to admire the latest vehicles to hire, it seemed strange being able to open car doors to inspect the interior when it was 11.30pm without a salesman in sight. We awoke refreshed the next morning and laid out our plans, they were quite simple, hire a Suzuki 4x4, visit David's mosaic, and then go wherever the road (or tracks) would take us. The mosaic is completely uncovered now, it measures some 10metres x 2.5metres, a fisherman stands, Trident in one hand, net in the other, further along two small Dolphins, their noses touching each other, around the whole mosaic is geometric patterns, at one end it opens up so that it takes the form of a T.
We took many pictures of it, but it is difficult to get the angles to show its true size and colour. Although it is now covered by a well built structure, a dusting of fine blown sand seems to be creeping over it. Whilst visiting we could not help but notice how much building work was going on, especially underground work, it was this that intrigued us so much. We had heard so many stories about recent discoveries of ancient burials etc, that we just had to keep looking at the 'work in progress' sure enough it seemed that everywhere they dug, they hit toombs! we even saw pottery still on what looked like window ledges, 3 metres below the surface. For any budding Indiana Jones, Cyprus is a must! Copyright 2003 Armata on behalf of Tony the owner. Click all pictures to enlarge them.